Ten-year-old Conrad was diagnosed with Type 1 diabetes earlier this year. 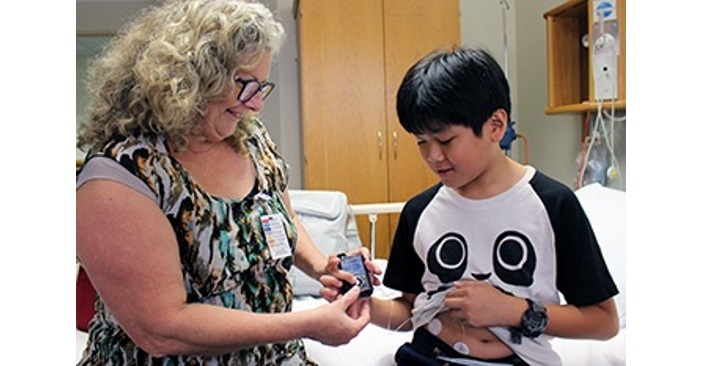 Recently, he became the first in Queensland and among the first in the world to receive a new kind of insulin pump that proactively monitors and predicts low glucose levels. The procedure was carried out by Dr Andrew Cotterill, paediatric endocrinologist at The Wesley Hospital’s Paediatric and Adolescent Service in Brisbane. The small portable device, which is small enough to fit in a pocket and connected by a tiny tube, was inserted under Conrad’s skin near the waist. Dr Cotterill said the new insulin pump has an additional feature that can continuously monitor glucose levels, providing additional safety for users. “The pump automatically suspends delivery of insulin when glucose levels are predicted to approach a low limit and resumes delivery once glucose levels recover,” Dr Cotterill said. Traditional pumps deliver a constant rate of insulin to keep glucose levels in the desired range, but this sometimes result in a hypoglycaemic event before suspending insulin. “This new device (MiniMed 640G) continually tracks glucose levels and shuts off insulin up to 30 minutes prior to a predicted hypoglycaemic event, thus preventing it from occurring. It drips steadily, releasing small, precise amounts of insulin, mimicking the biological function of the pancreas,” said Dr Cotterill. He added that patients with Type 1 diabetes who have the MiniMed 640G have lowered risk of having a hypoglycaemic attack, which, in extreme circumstances, can result in coma, seizure or even death. Most such attacks occur when the patient is asleep and so the pump will be of major benefit to diabetics. There are now 118,000 Australians living with Type 1 diabetes and 100 per cent of these people require insulin to manage their diabetes. The Medtronic MiniMed 640G System was developed by a doctor at Prince Margaret Hospital in Perth in a world first. It is considered the latest breakthrough toward an artificial pancreas for people living with diabetes.